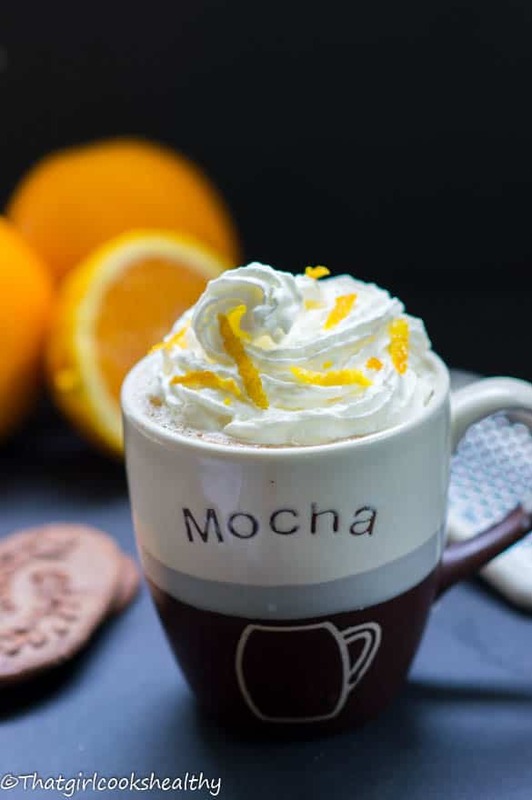 Orange hot chocolate recipe – this vegan orange hot chocolate made from almond milk with cacao powder is guaranteed to warm you up on a cold winters day. I think I was a squirrel in my past life because the temptation to hibernate is simply irresistible. Anyway, that’s enough of me rambling about the inevitable, it’s the same thing every year; spring, summer, autumn and winter, unless I move to a tropical country, if not, I have to accept what life throws at me. 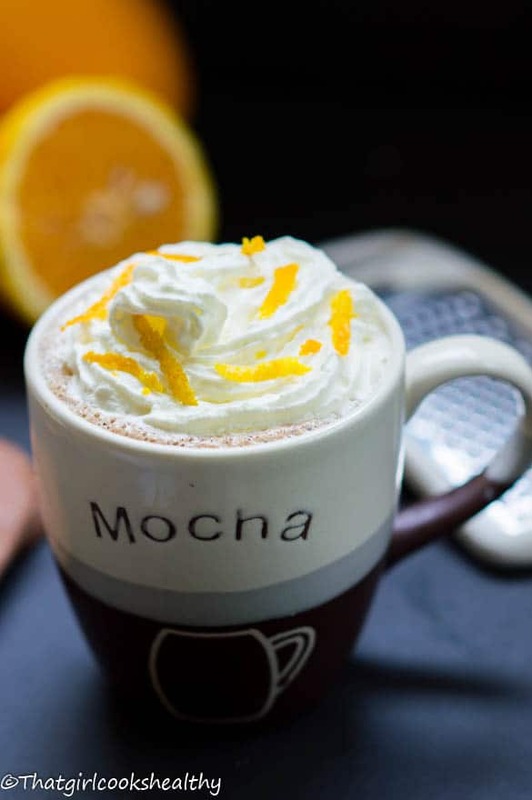 What is orange hot chocolate? What’s keeping my clinically sane right now is this little beauty above – Orange hot chocolate. 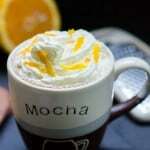 A sweet vegan chocolate beverage made from cacao, almond milk with orange zest for flavour. Are you familiar with Terry’s chocolate orange? If so, that’s what this hot chocolate is the equivalent to. The richness from the raw cacao truly compliments the zestiness of the orange. The orange flavouring for the hot chocolate comes from the zest. The longer the orange is left to seep the more intense the flavour becomes. Believe me when I tell you my friend – I came, I saw and I conquered this drink and now it’s time to share with you all. I sweetened the delicious hot chocolate orange with dates, date paste is suffice if you have that at hand and whizzed everything in the vitamix to begin with. 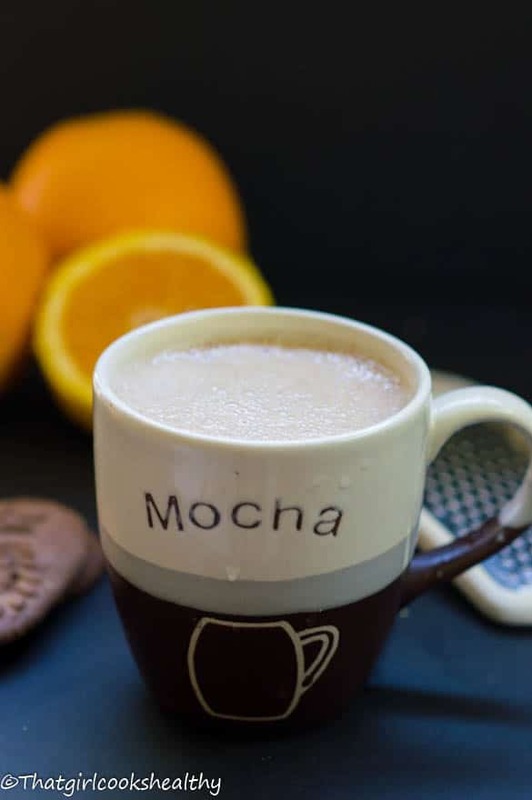 The power speed from the blender lends a lovely frothy top, from there I transferred the liquid into a sauce pan with the orange rind and hey presto – the birth of orange hot chocolate – non dairy and enriched with a tangy fruit flavour. Combine the almond milk, dates, vanilla, cacao and whiz in a blender until smooth. Pour the liquid into a saucepan with the squeezed orange, rind and bring to the boil. Once boiled reduce to low heat and simmer for 5 minutes, stirring occasionally. Remove pan from the stove and allow the orange rind to infuse for a further 2 minutes. Remove rind and serve accordingly. Looks delicious, another one I’m going to put on my list to try out! What have you topped it with in your pictures, some kind of vegan cream? Let me know your thoughts on this one. This one seems to be a hint with others especially with the cold snap. The topping is whipped coconut milk, I’m going to introduce the device I used to achieve the above in a separate post. I am going dairy free with my husband for weight loss purposes. I LOVE hot cocoa and dreaded having to give it up. Now I don’t have to! This one is delicious. I may have given it 5 stars had I topped it with coconut cream. Dana, no worries! Try the coconut cream next time!! So glad to hear that you like it.